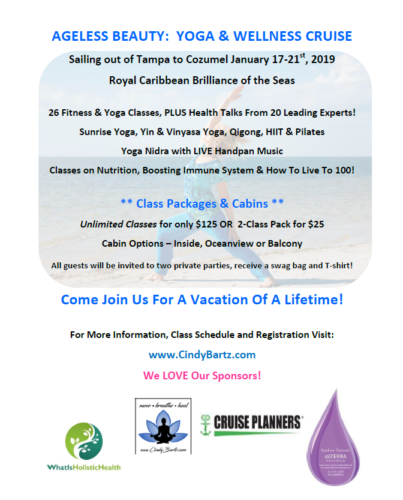 Dr. Alison will be one of 20 Leading Experts teaching on the Ageless Beauty: Yoga and Wellness Cruise in January! This cruise is going to be awesome and I hope you will join me. If you have wanted to get away, have a blast with like-minded people, attend yoga and other fitness classes and participate in talks on functional nutrition, weight loss and much more – then this is the vacation of a lifetime! Caribbean’s Brilliance of the Seas. 26 classes in yoga, pilates, tai chi, qigong, HIIT…PLUS live music, two private parties, and giveaways!